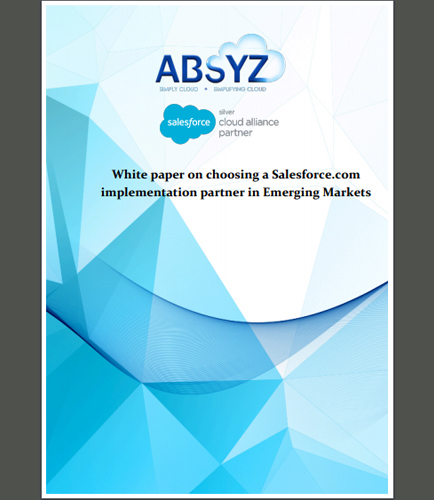 "Choosing the Right Salesforce.com Implementation Partner"
Choosing the right partner for salesforce implementation can be a daunting task in emerging markets. Building a successful Salesforce implementation plan enables you to customize the platform to suit your organization’s changing business needs. What are the ways of facilitating CRM adoption in Emerging Markets? What are the several challenges grappling the Emerging Market players in the choice as well as leveraging of their IT investment? Do they have a track record of building custom applications to meet the unique requirements of different types of businesses and business situations? Do they have extensive experience implementing a Salesforce solution with companies in your industry? When you’ve decided that Salesforce is the right CRM for your organization, the next step is to find the best consulting partner who has the potential to address your business needs with an impeccable, unwavering, rock solid and best-in-class solution. Today, customizing solutions is becoming less and less of a need than ever before. Standardized technology platforms from successful Enterprise Resource Planning (ERP) solutions have more capabilities than ever to handle most of your financial, human resources and payroll needs. When an ERP solution could not handle unique requirements organizations would need to turn to custom programmers who would leverage ACCESS databases, SQL databases, or even Oracle databases to gain unique functionality that organization could not live without. Dynamics CRM, a platform as well as a solution, provides non-profits and public sector organizations tremendous capabilities to leverage and address unique requirements never before accomplished without significant customizations. This whitepaper provides an overview of why Microsoft Dynamics CRM can be considered your next development environment when addressing unique requirements not covered in ERP. Hybrid Cloud computing essentially continues to offer businesses all the benefits associated with the public cloud whilst enabling them to continue to have choices of storing certain types of data privately. This hybrid cloud computing white paper guides on how hybrid cloud file server can be used by businesses to achieve their objectives, creating a virtual, cloud server managed by you - the service provider. This white paper on ''Hybrid Cloud Computing '' covers: What is a hybrid cloud file server? What are its solution features? How can hybrid cloud application help to solve the challenge of information aggregation, management, and control of all the companies of Information Clouds, from a single unique view? How can hybrid cloud computing serve your enterprise IT strategy? By intregating a cloud file server, you can reap the benefits such as: The Cloud File Server enables special folders to be set that all users in the company can instantly access. Secure Email Cloud File Sharing features The Cloud File Server enables unified access permissions for access across all Clouds that are mapped and exposed to the user base.